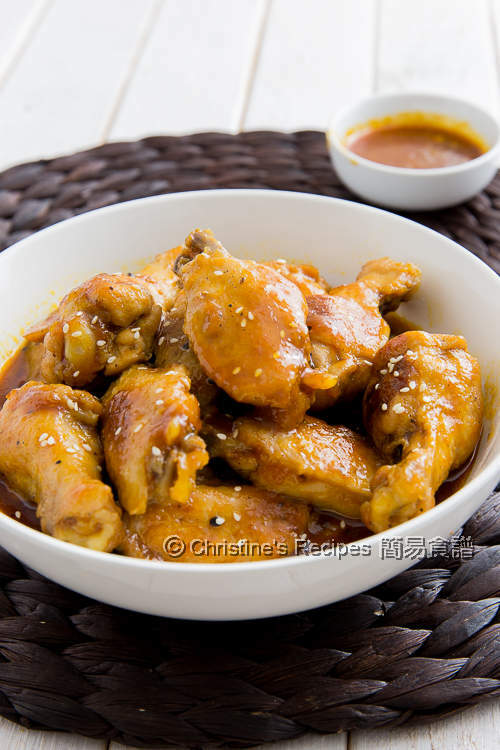 While writing up this recipe and browsing these barbeque (BBQ) chicken wings, I was still salivating. What makes the homemade BBQ sauce special and good is that you can tailor-make the taste to suit your own palate. This BBQ sauce is perfect to my family’s liking. The acidity is just right to balance the saltiness and sweetness with a mild kick. This sauce is also very versatile, going so well with meats. This time I tried with chicken wings with satisfied results. I didn’t even want to waste any sauce in the bowl by mixing with some steamed rice for my dinner, making the fresh soft steamed rice tasted even better. Rinse the chicken wings and wipe dry. Season with salt, pepper and garlic powder. Set aside for 15 minutes. Heat a little of oil in a fry pan over medium high heat. 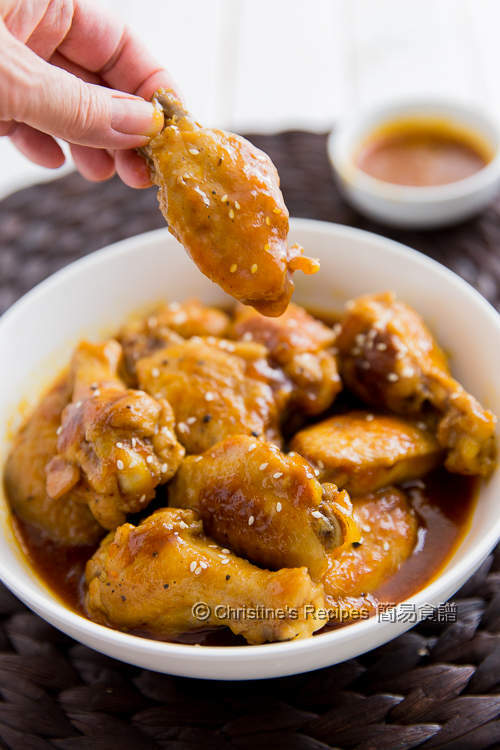 You don’t need to add too many oil as the chicken wings will release its oil. Cook until both sides are lightly brown. Use kitchen towels to absorb the excess oil. Pour in the BBQ sauce. Stir to combine. Cover and cook until the wings are done to your liking. Sprinkle sesame seeds for garnish. Serve immediately. This recipe is created with the homemade BBQ sauce. Simply measure out the quantity you need. You can use the store-bought BBQ sauce instead. Adjust the amount accordingly as the saltiness of your brand might be different. 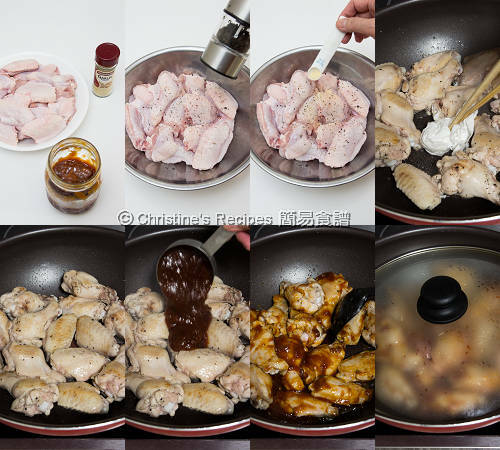 By pan-frying the chicken wings to render the oil, then absorbing the excess oil with a kitchen paper, it helps to make a less greasy dish. 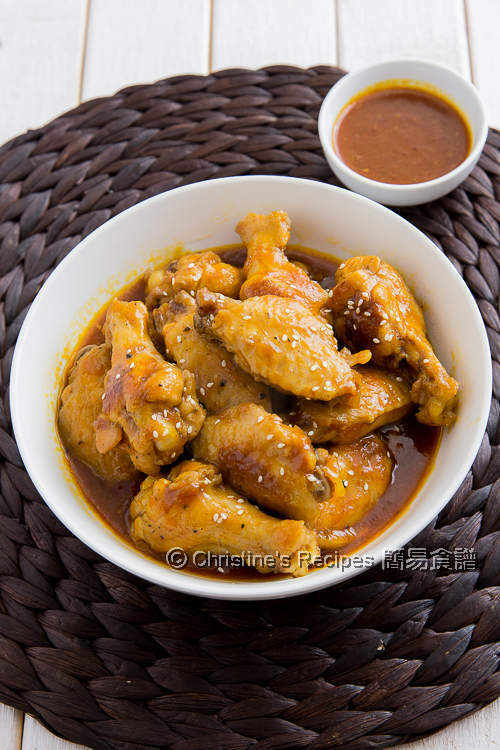 To get the best result, use free-range or organic chicken wings. I would probably mistake it as the curry sauce if you didn't say it's bbq sauce. They look fingerlickingly delicious. THIS LOOKS AMAZING!!! I love chicken wings and bbq sauce makes them infinitely better! It's a kind of mustard sauce. All supermarkets should carry it.